Central government's net financial assets decreased by EUR 4.8 billion from the previous quarter's level being EUR -65.7 billion at the end of the quarter. Assets decreased by EUR 3.9 billion as quoted shares and the stock of long-term loans declined. 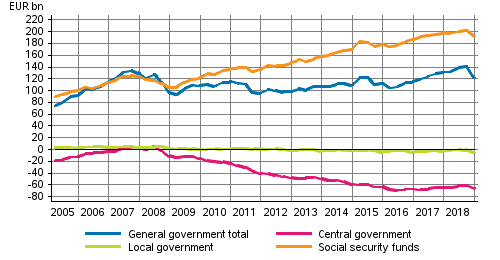 Local government's net financial assets fell by EUR 3.4 billion during the quarter. Assets contracted by EUR 0.6 billion and at the same time liabilities grew by EUR 2.8 billion. The liabilities stock of short-term and long-term loans was EUR 17.8 billion at the end of the quarter. Employment pension schemes' net financial assets stood at EUR 189.7 billion at the end of the quarter. Employment pension schemes’ net financial assets fell by EUR 10.3 billion compared to the previous quarter. In the last quarter, holding losses were EUR 4.5 billion for quoted shares and EUR 5.1 billion for mutual fund shares. ISSN=1798-1964. 4th quarter 2018. Helsinki: Statistics Finland [referred: 24.4.2019].